Peeking out from the aquamarine waters of the Eastern Caribbean nation of St. Lucia is a set of grandiose mounts that every traveler will come to know during their stay on the island. The Pitons are a symbol of St. Lucia and are visible across almost every part of the island’s landscape. Located at the mouth of Jalousie Bay in the southwestern St. Lucian town of Soufrière, the Pitons rise about 2,500 feet above sea level. The twin peaks were dubbed a UNESCO World Heritage site in 2005 with Gros Piton rising to a height of 2,619 feet(786 meters) while it’s sister mountain, Petit Piton, is slightly smaller at 2,461 feet (739 meters). On a clear day, the islands of Martinique, Dominica, Barbados, and St. Vincent are visible from the top of either peak. The jewels of this island beckon locals and tourists alike to journey to the top of the mounts. When deciding which Piton to hike, there are a few things to keep in mind. Although Petit Piton is the shorter of the two, it is steeper and therefore not recommended for novices. Instead, most visitors choose Gros Piton for their tour, a hike that takes about four hours total—two to go up and two to come down. While a hiker who is experiencing the Pitons for the first time will find every view to be spectacular, returning hikers should ask their tour guide to take a different route for another view of the island. 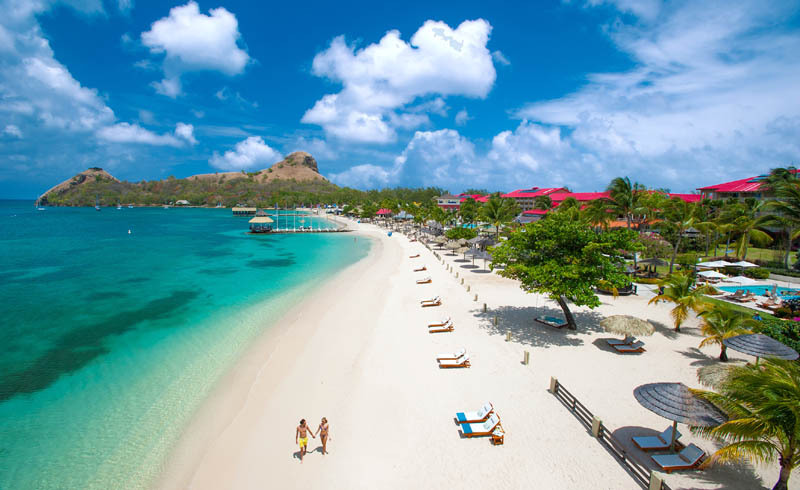 The best time to visit St. Lucia is from mid-Augustto the end of October, when temperatures rarely fall below 87°F (30.6º C)—this is also right before the rainy season in November. Several resorts offer stunning panoramic views of this stunning duo including Viceroy Sugar Beach, Ladera Resort, Jade Mountain, and Calabash Cove, among others. Book your tour in advance to guarantee a spot during your time on the island or you can also show up at the hike’s entrance—just note that some tours may fill up. If you reserve tickets for a tour ahead of time you can pay with a credit card. For day-of tours you must bring cash, and you will find that most shops and markets on the island only accept cash. The cost of the climbing tour is usually $90 per person (but can vary), and guided hikes start between 6:30 a.m. and 9 a.m. Book your hike by visiting the Gros Piton website or through Real St. Lucia Tours, and keep in mind that you will be asked to sign a waiver. Pack light for your Caribbean travel adventure with a convenient carry-on bag, and make the most of your packing space with compression packing organizers. For your hike, you’ll want to prepare for the elements. Lucia is hot and sunny, but bound to experience a few bouts of rainfall here and there, so dress accordingly. For footwear, sneakers or hiking shoes are the safest bet. You’ll want to bring a few water bottles, a light snack (a granola bar or energy bar will do), sunscreen, a camera, bug spray (there’s tons of mosquitoes), and sunglasses in your hiking daypack or waist pack. Your tour guides are native St. Lucians who can probably climb these mountains in their sleep, so unless you’re an experienced hiker, take it slow—no one will judge. You will most likely be with a group of people with varied experience (my group had a mix of amateurs including myself, a few moderately experienced travel trekkers and advanced climbers with walking sticks). Save plenty of energy for the second half—surprisingly, coming down is much harder. Tired legs, the natural dirt trails, and a slippery slope are all working against you. While the views are gorgeous from both land and sea, you will only get to experience the true beauty of these mountains from the peak. The bottom of the mountain is very rocky as you make your way through Ay Poye Park gates to get to the nature trail. On your way up the steep, rooted mount there are a few checkpoints (flat open areas, some with benches) that serve as rest stops and photo opportunities. Be careful taking pictures during your trek to the top as there are minimal to no railings to hold onto. You’ll want to focus on climbing safely and swiftly. Can’t make it to the top? Making it halfway is still a huge accomplishment. After a rest in the middle, your tour guides will give the group the option to continue on or head back down the mountain with a guide. On your way back down the mountain, there is a small hut tucked away that serves libations, snacks, ice cream, and souvenir shirts that mark your hiking accomplishment. There are also similar refreshments waiting for you at the top. It’s a thrilling climb, with a lot of natural beauty, flora, and unique rock formations to take in. It’s no easy feat, but the view is breathtaking. 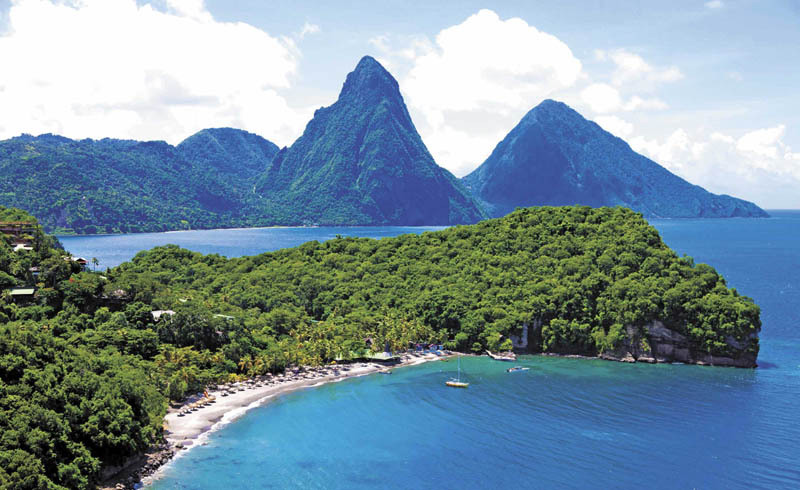 No matter when you visit St. Lucia, the Pitons are a wonder to behold. Let us know your experience conquering the climb in the comments below!